ISPRS is an international NGO devoted to the development of international cooperations for the advancement of knowlege, research, development and education in the Protogrammetry, Remote Sensing and Spatial Information Sciences (P&RS&SIS), their integration and application, to contribute to the well bieng of hunanity and sustainability of the environment. The IAU Working Group on Cartographic Coordinates and Rotational Elements (WGCCRE) has been given the responsibility by the International Astronomical Union to define the rotational elements of the planets, satellites, asteroids, and comets of the solar system on a systematic basis and to relate their cartographic coordinates rigorously to the rotational elements. The Mars Ice Consortium is a joint project between the USGS Astrogeology Research Program (Flagstaff, AZ) and the Arizona State University Mars Space Flight Facilty (Tempe, AZ) to bring together a single resource for the exploration of martian ices. Much of this research is done at the USGS Flagstaff Science Center. Volcano-alert notifications are produced by Volcano Observatory scientists based on analysis of data from monitoring networks, direct observations, and satellite sensors. They are issued for both increasing and decreasing volcanic activity and include text about the nature of the unrest or eruption and about potential or current hazards and likely outcomes. This dataset contains data on the length, mass, and muscle total mercury concentration of Brown Trout (Salmo trutta) and Rainbow Trout (Oncorhynchus mykiss) collected from the Colorado River in Glen Canyon National Recreation Area (GLCA) and Grand Canyon National Park (GRCA), and Bright Angel Creek in GRCA. The Land Treatment Digital Library (LTDL) was created by the USGS to catalog legacy land treatment information on Bureau of Land Management lands in the western United States. The LTDL can be used by federal managers and scientists for compiling information for data-calls, producing maps, generating reports, and conducting analyses at varying spatial and temporal scales. This software allows agencies, organizations, and individuals to download an empty, stand-alone Land Treatment Digital Library database to individual or networked computers. 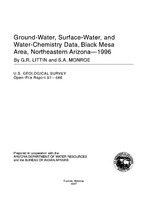 Data entered in these databases may be submitted to the USGS for possible inclusion in the online Land Treatment Digital Library (https://ltdl.wr.usgs.gov). This dataset was used as the basis for estimating land disturbance from oil and gas activity in the UCRB. The dataset is a compilation of five state oil and gas datasets from June of 2007. The intended uses of this data set include, but are not limited to, natural resource modeling, mapping, and visualization applications. 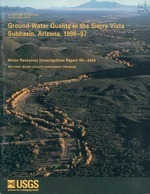 Bills, Donald J.; Truini, Margot; Flynn, Marilyn E.; Pierce, Herbert A.; Catchings, Rufus D.; Rymer, Michael J.
Hydrogeology of the regional aquifer near Flagstaff, Arizona, 1994-97; 2000; WRI; 2000-4122; Bills, Donald J.; Truini, Margot; Flynn, Marilyn E.; Pierce, Herbert A.; Catchings, Rufus D.; Rymer, Michael J.
Owen-Joyce, Sandra J.; Wilson, Richard P.; Carpenter, Michael C.; Fink, James B. Method to identify wells that yield water that will be replaced by water from the Colorado River downstream from Laguna Dam in Arizona and California; 2000; WRI; 2000-4085; Owen-Joyce, Sandra J.; Wilson, Richard P.; Carpenter, Michael C.; Fink, James B.
Parker, J.T.C. ; Fossum, K.D. ; Ingersoll, T.L. Chemical characteristics of urban stormwater sediments and implications for environmental management, Maricopa County, Arizona; 2000; Article; Journal; Environmental Management; Parker, J. T. C.; Fossum, K. D.; Ingersoll, T. L.
Monitoring the Effects of Ground-Water Withdrawals from the N Aquifer in the Black Mesa Area, Northeastern Arizona; 1999; FS; 064-99; Littin, Gregory R.
Modeling of flood-deposited sand distributions in a reach of the Colorado River below the Little Colorado River, Grand Canyon, Arizona; 1998; WRI; 97-4168; Wiele, S. M.
Littin, Gregory R.; Monroe, Stephen A.
Ground-water, surface-water, and water-chemistry data, Black Mesa area, northeastern Arizona, 1996; 1997; OFR; 97-566; Littin, Gregory R.; Monroe, Stephen A.
Rote, John J.; Flynn, Marilyn E.; Bills, D.J. 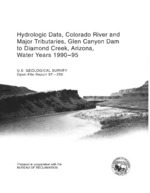 Hydrologic data, Colorado River and major tributaries, Glen Canyon Dam to Diamond Creek, Arizona, water years 1990-95; 1997; OFR; 97-250; Rote, John J.; Flynn, Marilyn E.; Bills, D. J. On an average day during the fire season, multiple wildfires burn in the western United States. For example, 216 fires were active on July 7, 2017. Firefighters were battling 27 of these fires through ground and air support. This image of the Las Vegas /Lake Mead / Grand Canyon area was acquired on June 16, 2017, with Indian Space Research Organization’s Resourcesat-2 AWiFS sensor. Images of this region can be useful to help detect changes in vegetation and water availability for growing desert communities. An extremely rare Mojave River western pond turtle was recently observed by USGS scientists and staff from The Living Desert Zoo and Gardens in the Mojave Desert. Turtles of this population have rarely been seen since the late 1990s. The Arizona Water Science Center discusses the use of a new method, called particle tracking, that will revolutionize the way USGS obtains stream flow data. An animation of the USGS topographic map of Mercury created using images from NASA’s MESSENGER spacecraft. Employees of the Arizona Water Science Center describe their experiences working for the USGS revealing that it is far more than just a workplace. A view of the Grand Canyon, with the Great Unconformity visible. Credit: Alex Demas, USGS. Aerial view showing the intense greenup of restoration plots in the lower Colorado River Delta following the 2014 Minute 319 pulse flow. Streamflow and groundwater levels are declining in some locations along the San Pedro River near Sierra Vista, Arizona, according to a new report by the U.S. Geological Survey. Future groundwater replenishment in the Upper Colorado River Basin may benefit from projected increases in future basin-wide precipitation under current climate projections, according to a recent study by the U.S. Geological Survey and Bureau of Reclamation. To gain insights into the risks associated with uranium mining and processing, U.S. Geological Survey scientists are investigating how uranium moves into and up food chains. Laura Norman was asked to provide a presentation at the Hassayampa River Study meeting. Stakeholders in the 3,700 km² watershed are interested in the benefits of hydrologic modeling to assess if stormwater management practices would impact stormflows, sedimentation, and groundwater recharge. Mountains on Io, Jupiter’s volcanic moon, are formed by a unique geologic mechanism not found elsewhere in the solar system, according to a new study by the U.S. Geological Survey. The first topographic map of Mercury was released today by the U.S. Geological Survey, Arizona State University, Carnegie Institute of Washington, Johns Hopkins University Applied Physics Laboratory and NASA. With the release of new US Topo maps for Illinois and South Dakota, the USGS has completed the second, three-year cycle of revising and updating electronic US Topo quadrangles. This means that since late 2009, the USGS has published nearly every map in the conterminous U.S., twice. On average, streams in the Niobrara-Mowry Play of eastern Wyoming, Fayetteville Play of Arkansas, and Barnett Play of Texas ranked most vulnerable to unconventional oil and gas development, but for different reasons, according to recent U.S. Geological Survey coauthored research.